The last time the two superstars got together on stage was for the audio release of Mammootty’s Thappana. 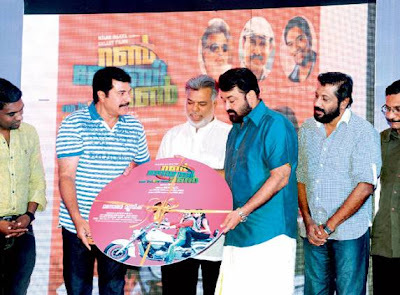 This time, the occasion was the audio release of Mohanlal’sRun Babby Run. Dressed in a blue striped Tee and jeans, Mammootty presented a sharp contrast to Mohanlal, who was attired in a traditional shirt and mundu. Mohanlal has also crooned a melodious song Aatumanal payayil... which has been eliciting a good response from the listeners. The song visual shows Mohanlal frolicking with Amala Paul and is set in a sensuous mood. Mammootty, who took to the stage also complimented Mohanlal’s talent and said, “I have been hearing this song constantly on the airwaves and was wondering about the film name. It is only now that I realise that the song is from this film. The others present on the occasion were producer Milan Jaleel, Siddique, B. Unnikrishnan, Johny Antony in addition to the director of the film Joshiy. Amala, busy with her Tamil film, could not make it to the audio release.